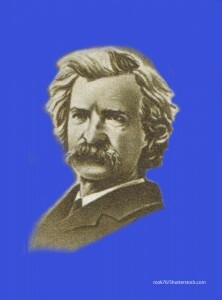 Mark Twain- "Whenever you find yourself on the side of the majority, it is time to pause and reflect." There are two times in a man’s life when he should not speculate – when he can’t afford it and when he can. By trying we can easily learn to endure adversity — another man’s I mean. I didn’t attend the funeral, but I sent a nice letter saying that I approved of it. Of all God’s creatures there is only one that cannot be made the slave of the lash. That one is the cat. If man could be crossed with cat it would improve man, but it would deteriorate the cat. We have a criminal jury system which is superior to any in the world; and its efficiency is only marred by the difficulty of finding twelve men every day who don’t know anything and can’t read. He had discovered a great law of human action, without knowing it – namely, that in order to make a man or a boy covet a thing, it is only necessary to make the thing difficult to obtain.